Italian Dumplings are the perfect comfort food. Also described as ricotta gnocchi, fresh Italian Dumplings are easy to make at home. The ease and versatility of our Ricotta gnocchi recipe will have you wowing guests at your next dinner party. Make our Italian Dumplings at home and have fun preparing three easy ricotta gnocchi recipes. You’ll fall in love with our Simple Tomato Sugo with Italian Dumplings, Gorgonzola Mushroom Cream with Italian Dumplings and Leek, Bacon and Squash Soup topped with fresh Italian Dumplings. Italian Dumplings rest in extra virgin olive oil after boiling in a pot of salted water. Gnocchi are Italy’s famed Italian dumpling. The classic Italian pasta is traditionally made with either potatoes or ricotta cheese. The word gnocchi comes from the Italian word nocchio, meaning a knot in wood, which explains their petite size. It has been a traditional food-staple in Italy since Roman times. The common thread between both varieties of Italian Dumplings are a handful of ingredients and cooking process. Most Italian Dumpling recipes are made with eggs, flour, salt and pepper. Once Italian dumpling dough has been prepared, both potato and ricotta recipes require boiling in salted water. My preferred Italian Dumplings are ricotta gnocchi. They’re less finicky than working with potato gnocchi. I enjoy the soft texture of a ricotta dumpling more than the tougher density of recipes made with starchy potato. Our Italian Dumpling recipe features flour, eggs, ricotta, nutmeg, salt and pepper. Once you master Italian Dumplings you'll never open a bag of dried pasta again. You'll laugh at the idea of bringing home those dried up store bought gnocchi! All you need in your kitchen is a mixing bowl, wooden spoon, large pot and slotted spoon. Bring a large pot of salted water to boil then reduce to a simmer. 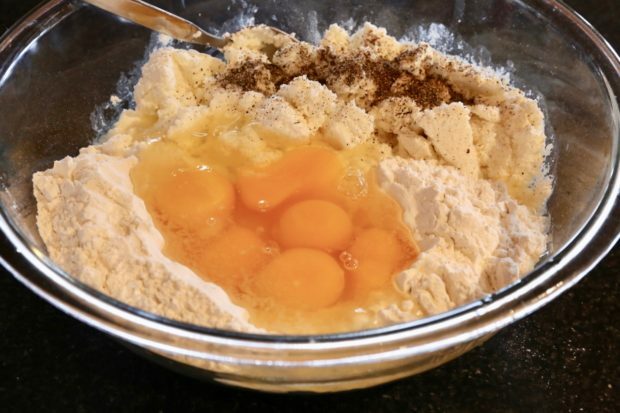 Whisk eggs in a large bowl, then incorporate ricotta, flour salt, pepper and nutmeg. Use two small soup spoons to drop rounds gently into boiling water. Simmer Italian dumplings for 4-5 minutes then using a slotted spoon place onto greased oiled sheet. 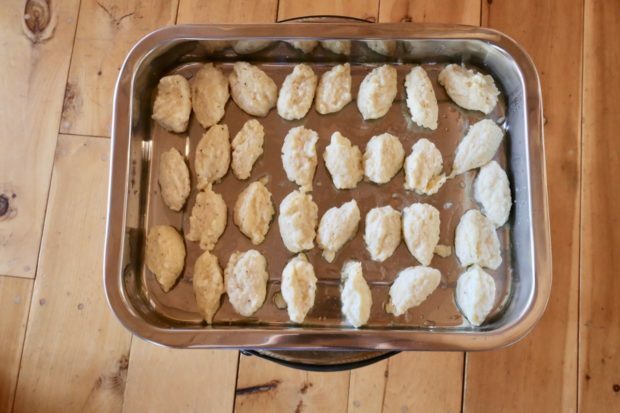 NOTE: you can make ahead by cooking the dumplings then cooling on the oiled baking sheet. Store in an airtight container in the fridge after tossing in oil to ensure they don't stick. 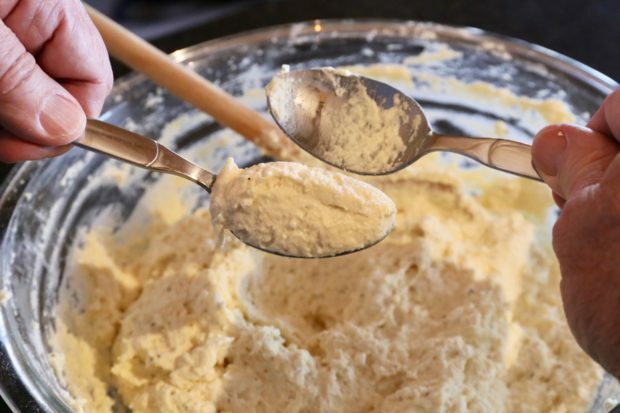 Italian Dumplings are formed from dough into cute quenelle’s by pulling away two spoons. Once you’ve made your first batch of Italian Dumplings you’ll want to ensure you’ve got a sauce or two up your sleeve. We’ve developed three recipes that celebrate soft and savoury ricotta gnocchi. Pair your plump ricotta gnocchi with a simple tomato sugo, hearty mushroom and gorgonzola cream, or add them to a steaming bowl of leek, bacon and squash soup! Italian Dumplings with tomato sugo topped with grated parmesan cheese. The most Italian way to enjoy ricotta gnocchi is by serving with a simple tomato sugo. I like to double or triple the recipe whenever I make it so I always have a fresh jar of homemade tomato sauce in the fridge. Perfect for a last minute meal when your week is a rush. If you’re hosting a dinner party and don’t want to deal with plating for each guest you can easily transform this dish into a casserole. Simply spoon tomato sugo into an ovenproof dish, top with fresh Italian Dumplings and top with either parmesan or mozzarella. Pop in the oven at 350F and remove once the tomato sauce is bubbling and cheese has browned into a crispy gratin. In a large pot over medium heat add olive oil, garlic and onion. Cook for 3-5 minutes until golden brown. Add pasata and marsala, simmering on low for 7-10 minutes. Then add chopped basil, salt and pepper to taste. 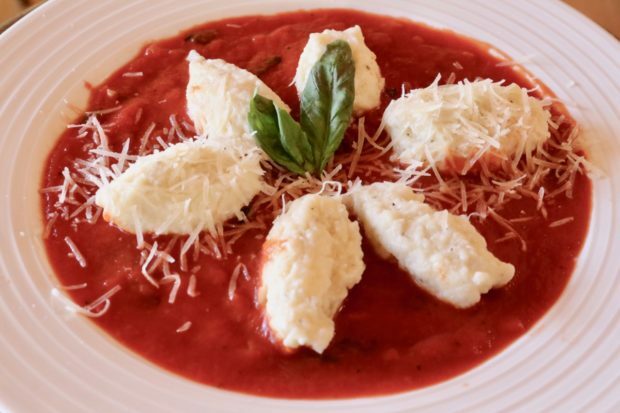 Toss tomato sugo with Italian Dumplings and serve topped with grated parmesan. 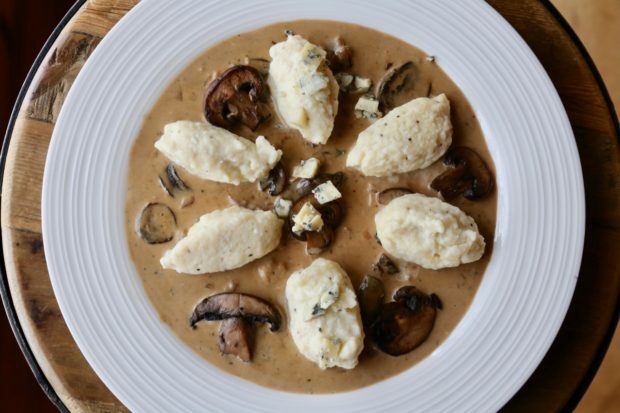 Plump Italian Dumplings paired with a creamy mushroom and blue cheese sauce. My father is obsessed with ricotta gnocchi. If we’re out at a restaurant and my dad sees Italian Dumplings served with a variation of cream, mushrooms and cheese he’ll be spooning it out of a bowl moments later. 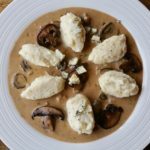 I love making these Ricotta Dumplings during the Fall or Winter. This hearty dish sticks to your bones, best enjoyed after raking leaves at the cottage or getting home hungry from the ski slopes. I use gorgonzola in this recipe but feel free to try other varieties of blue cheese. Gorgonzola is a milder blue cheese so be sure to taste your sauce before serving. If you’ve chosen a stronger blue cheese for your cream sauce you may want to thin it out by adding additional honey, beef stock or marsala. Add butter to a frying pan with sliced mushrooms and sauté over medium heat for approximately 10 minutes. Tend mushrooms by the stove, flipping them with a wooden spoon or spatula to ensure they receive consistent and even browning. Add minced garlic and diced onion, cooking for 3-4 more minutes until lightly browned. Add beef stock and marsala before turning the heat to medium low. Allow to simmer for 2 minutes before adding cream, honey, and blue cheese. Stir for approximately 5 minutes. You’ll know your sauce is done once it has slightly reduced and the gorgonzola cheese has melted and incorporated into the cream sauce. Add salt and pepper to taste then ladle your sauce onto serving plate or bowls and top with fresh Italian Dumplings. Italian Dumplings floating in a leek, bacon and squash soup. This soup recipe proves how versatile Italian Dumplings can be in your kitchen. 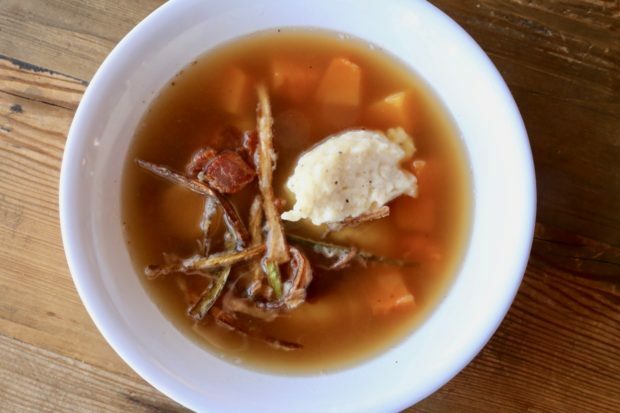 The heartwarming broth features crispy leeks, smoked bacon, and diced butternut squash. I like to make this soup with leftover dumplings as you really only need two or three ricotta gnocchi in a bowl to satisfy your cravings. Add canola oil to a small frying pan on medium high heat. Meanwhile, in a small bowl toss julienned leeks with a pinch of salt and flour. Add leeks to sizzling oil and fry until golden brown. Remove leeks from the pot and let rest on a paper towel. In a large pot add chicken stock and simmer on low. In a vegetable steamer over medium heat cook butternut squash until al dente, approximately 5-7 minutes. In a frying pan cook bacon over medium heat until crispy golden brown. When ready so serve, pour steaming broth into soup bowls and top with 4-6 Italian dumplings. Add squash and bacon to each bowl and top with crispy leeks.